Though the work hasn't been so visibly dramatic the past few weeks, it is so exciting! The electrician has been working steadily and there are now plugs and sockets awaiting fixtures. There is insulation being put up every day. Though a bit blurry, this is the view from their porch of a changing maple tree, and another one on the east side of the house. 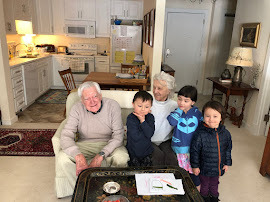 Margaret and Matthew have begun looking at kitchen cupboards; they bought a ceiling fan which will hang in the loft; they've picked out the refrigerator, stove, and dishwasher. Things are moving along beautifully! light or set on fire. I am not a Luddite. Even though I eat organic food and have been a vegetarian for almost 40 years and I live out in the country, I still love technology. I love texting. I obviously love my Mac computer. We've always had good audio equipment, etc. etc. So I pondered, why am I so resistent to a Kindle? The usual reasons came to mind. I love the feel and look of print. I don't think I'd enjoy reading on a device. But then the little voice in my head said, wait a minute, you read and read and read on such a device - the computer. I could spend all day sitting here reading your blogs. And after that I thought, wouldn't it be nice to read a great big biography and not have to hold the book? When the price came down to $139, we said, why not? So, I preordered the end of July and here it is. My little bundle of electronic reading joy. My camera died a week ago, and I have a new one on order, but Tom borrowed one from a colleague so I could document this huge excitement at Windy Poplars Farm. When it arrived today the UPS fellow said, 'I know what this is!' He told me he had delivered quite a few. He then asked how I thought I'd use it, and I said, probably old books that are quite cheap and heavy nonfiction books. He talked about holding such books when one is lying in bed, and I said that I've already hurt my shoulder/arm in this way. He called it 'reader's shoulder' which I just love. I think what I'll do is have a downstairs print book and a bedtime kindle book. Now the great decision was what to buy for my very first book. I had given it quite some thought and even begun a bookmark, 'kindle books I want,' but still that first purchase is kinda special. Should I buy one of the nonfiction titles I've been dying to read? 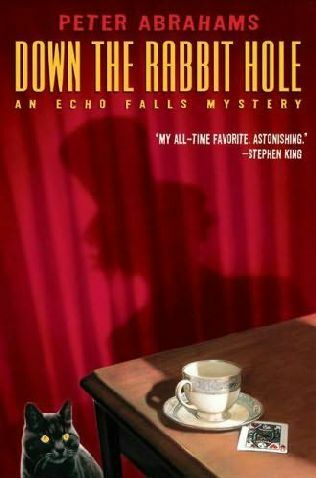 A new installment in a favorite mystery series? An old beloved title? Something by Agatha Christie? I ended up buying three. 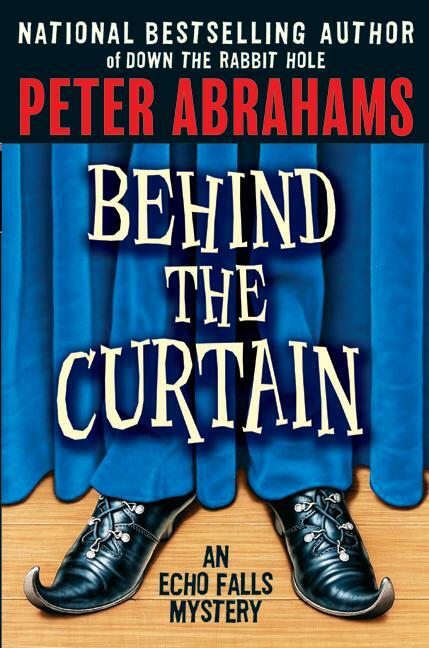 Throughout these first three (and only, so far) books in Peter Abrahams' Echo Falls series, I thought to myself, 'He's got it. He gets how a thirteen year-old thinks.' As an adult reading along I noticed clues but often Ingrid Levin-Hill misses them, as any kid might. I liked it so much that she wasn't a genius child-detective or even that good in school. Yes, she adores the Arthur Conan Doyle books, but most of the time she can't grasp what Sherlock Holmes is telling her that may connect to the cases she herself is involved in. Ingrid is believable because she doesn't always figure things out. Sometimes I have had an inkling of something that doesn't occur to Ingrid, and this feels right because I am an adult and she isn't. Anyhow, I realized that I had a way of getting into the mind of a real thirteen year-old girl. I could look in my diary from that year in my own life. Granted I was a girl of the early 1960s, and times have certainly changed, but I thought there might still be some similarities. I opened to a random page, August 12, and found a probably typical day in my thirteen year old life. I began each entry 'Dear Diary' and ended the day with 'Nite Joan' - the name I had given my little book. At about 2 I went over to Anne's and played canasta. At 3 I went to the laundermat [sic] with Mom. This morning at 11 I went to the library & got Twixt 12 & 20 & Mindy. Then speaking of Anne I wrote, 'I hope we always stay "best friends." Tom reminded me that the junior high girls still write BFF, best friends forever. Oh, and Anne and I are still friends, though we live on other sides of the country. We learn the details of Ingrid's daily life in much the same way; her brother drinking orange juice directly from the carton, the foods she eats. But a big difference between my life and Ingrid's is that my mother was always home. I couldn't have done (gotten away with) most of the things Ingrid does just for that reason. Part way through the first book it struck me that a number of the situations Ingrid becomes involved in happen because her parents are late or cannot pick her up. This is the first book I've read that very subtly shows what can happen in good families, intact families, just because both parents are involved in their work. And there's something in the way Ingrid notices they haven't arrived that made me feel this is a not-so-uncommon occurrence. Ingrid gets into some iffy situations for no other reason than her parents don't pick her up on time, or at all. And the father, who at first seemed kind of low-key and warm, shows himself to be an exceedingly pushy parent. He is constantly on his freshman son to build himself up physically to be a better football player. And he wants Ingrid to be on the fast track of math so she can get into Princeton, or at least one of the other prestigious schools. These facets of the Levin-Hill household are not preached at the reader. There is nothing obviously stated, but an acute reader (maybe just an adult, a parent?) sees these things all too well. I have great praise for this author who can convey both a young girl, her brother, and her parents in such a realistic way. They weren't stereotypes. They were all people with strengths and weaknesses. This continues into the second book, Behind the Curtain when Ingrid accepts a ride home from a new man in town, again because her parents couldn't bring her home. Granted he was in a community play with her, but honestly what was the play director thinking? Whenever Tom has supervised an event, whether snowboarding/skiing or a dance, he does not leave until all the students' rides have arrived. And there have been many instances over the years where he is there for over an hour waiting, though the parents had been well-informed of the pick-up time. Each of the book titles is from a play that Ingrid is performing in. Sometimes they are student plays and other times they are community plays. The first is about Alice in Wonderland, the second about The Wizard of Oz, and the third Hansel & Gretel. Again, very subtly, these plays are a kind of metaphor for what Ingrid is going through in her life. Ingrid loves acting and she is a natural. But as in the rest of her life, the plays don't always run smoothly. Abrahams understands so well the ups and downs of this time of life. Things can change on a dime. An early teen can go from happy to sad in the blink of an eye. I realize I haven't told anything about the plots, but you may discover them for yourself as you read these outstanding books. The third book was definitely the 'darkest' so far, and it shows why this series is more for young adults than juveniles. There are more upsetting situations; illness, infidelity, animal cruelty (the latter we do not see but we do know it occurred - difficult for this reader with a too-good imagination). The falls after which the town in Connecticut was named always features in the books in some way. The past history of the town is also important in the present day occurrences. Ingrid's grandfather owns the last farm in town, and this comes up in every book because of course developers want to use all this 'empty' space. The irony is that Ingrid's father works for the developers and her mother works in real estate. Ingrid and her grandfather are quite close, though he doesn't talk much about his past or his feelings; and he allows her to do some things her parents would not approve of such as shooting guns and driving a tractor. It was a treat for me to read these three books. I enjoy mysteries but sometimes my beloved crime fiction is a little too graphic for me. In these books, I know that Ingrid isn't going to be assaulted or killed. Although there are bad guys, they aren't grossly bad. I can sit back in my chair and thoroughly enjoy my reading without wincing or worrying what might happen. I mentioned it in my book report on Thereby Hangs A Tail that Spencer Quinn is a pseudonym for Peter Abrahams, and that is what drew me to read these books. 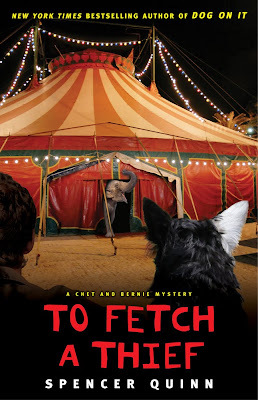 Both the Chet and Bernie series, and the Echo Falls series are excellent and well-written, with warmth and humor and suspense. Before I begin my rave review of the Mrs. Pollifax books, I'd like to take a minute to explain how my reading situation is different in the summer months. One of the interesting features of our homestead is that a few years ago we began getting no-see-ums; little tiny bugs that come right through any screens. They have a terribly itchy bite. They are present mostly when the sun goes down and are attracted to light so over time we have learned to keep the lights off in the evening. The television seems to be okay and there we sit in the evenings, watching our Netflix dvds. What this means is that I don't read print books after dark, but what I can do is listen to audio cds or tapes. It may well be that the reason I stayed with The Man Who Loved Books Too Much is the fact it was an audiobook. I often stick with an audiobook longer than I would a print version because I don't have a lot of choice at the libraries I visit. I am simply not interested in many of the books they offer so that I continue with one that is even mildly appealing just to have something to read. I have had times when I've rented from Recorded Books, a great source of unabridged audio, but the cost is steep, and again they don't always offer what I want to read. 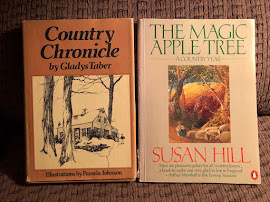 This summer I revisited my beloved Mrs. Pollifax books. I have probably listened to the whole series three times already but it never ceases to delight me. Barbara Rosenblat is such a gifted narrator. I loved her as Amelia Peabody and I love her as Mrs. Pollifax. When we first meet Emily Pollifax, she is quite depressed. Her husband is dead. Her children are grown and live far away. She lives in an apartment in New Brunswick, New Jersey. She is active as a volunteer but she feels unfulfilled. One day when she goes up on the roof to water her geraniums, she almost takes a step off. She realizes she must do something about her life, and recalls that as a child she wanted to be a spy. She heads off to Langley, Virginia to the Central Intelligence Agency to apply for a job. She accidently gets that job when she is mistaken for an occasional courier. She does her assignment so well in her first adventure that she is hired by the CIA. In the course of the books, she visits Mexico, Albania, Turkey, Bulgaria, Africa, and many other places, some real and others fictional. The landscape details are so precise, so well-written that the reader can really visualize her surroundings. Various people appear in all, or most of the books: Carstairs her boss, his assistant Bishop, and a free-lance, field operative named John Sebastian Farrell. Mrs. Pollifax is not simply a cute older lady off on adventures or mis-adventures. These books are spy books, with real bad guys who do serious harm. Emily is a believable character who works very hard at her job. She is truly kind and caring. She learns karate to help her in difficult encounters. She grows with each book, and even remarries and moves to a house. Cyrus, her husband travels with her occasionally. I so recommend these books. They are excellent spy stories, travelogues, mysteries, and character studies. There is occasional humor but for the most part they are serious adventures for Mrs. Pollifax and her readers. 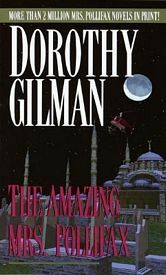 I was thrilled that Dorothy Gilman was the Grand Master at the Edgar Awards this year, a well-deserved recognition of her work. I wrote about one of my favorite books, A Nun in the Closet here, and intend to read all the other books which Dorothy Gilman has written. I expected to like this book more than I did. I'm sure it is a big hit among book lovers, but I thought it quite weird and sad. Part of it is the subject matter, but also I was uncomfortable with the writer and how she went about her work. When I finished I found myself thinking how Truman Capote got caught up in the In Cold Blood story. He formed a relationship with the killers, as Allison Hoover Bartlett did with the criminal, John Charles Gilkey, the man who stole expensive rare books. There is an early article by the author on the subject here. 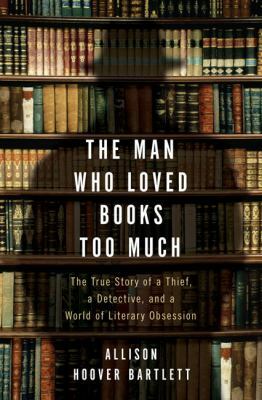 I have a really hard time understanding someone who, 1. steals anything and 2. steals books he doesn't love or even read. I know the book has gotten raves, but the subject matter just isn't for me. It was troubling to me that the guy got the idea from reading John Dunning's Cliff Janeway series. Although I do feel it is important to preserve old books, I found the whole world of antiquarian bookselling to be most unappealing. And I don't get 'manias' period. And I am not a collector of anything. 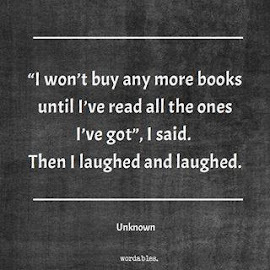 And I don't care if what I read is a first edition or signed or mine or from the library. So, you may ask, why did she finish the book. And I can't tell you the answer. Alphabet Juice by Roy Blount, Jr. 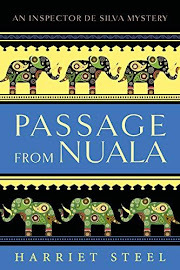 If you'd like to read a bit of the book before deciding if it is for you, the first chapter is here, and if you have a fast internet connection, and have some free time, there is a great video of him here. Roy Blount, Jr. has such a gift for combining learning with humor. His joy in words is infectious. He's the teacher you always wanted. His passion for language is wonderful. The book's subtitle is: The Energies, Gists, and Spirits of Letters, Words, and Combinations Thereof; Their Roots, Bones, Innards, Piths, Pips, and Secret Parts, Tinctures, Tonics, and Essences; With Examples of Their Usage Foul and Savory, which makes it irresistible to those who love words and language. I highly recommend it (and will search out a print version for myself). One day I stopped in our local bookstore and began browsing through the juvenile section; for 9-12 year olds as they say on the book covers. 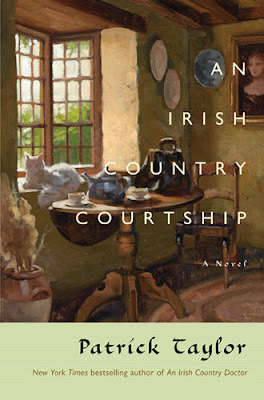 I found two very appealing books by the same author, Siobhan Dowd. I bought them, and came home to look her up on the internet. I was so saddened to read she had died three years ago at the young age of 47. 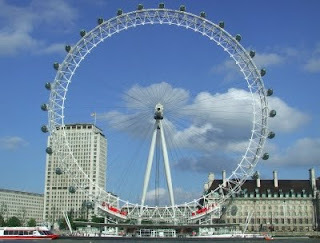 Siobhan Dowd, the author of The London Eye Mystery, intended for the book to be the first in a series of adventures featuring Ted and Kat, the story’s main characters. Each mystery would be set in, or around, a famous building or landmark, somewhere in the world. Sadly, Siobhan died before she was able to write any of the follow-up adventures, and The London Eye Mystery remains the only story featuring our intrepid amateur detectives. 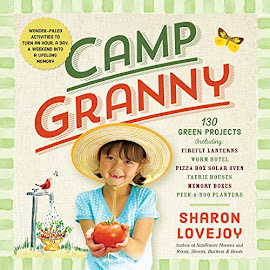 The narrator of the book is a twelve year old boy named Ted. He tells us early on: 'my brain runs on a different operating system from other people's. I see things they don't and sometimes they see things I don't.' 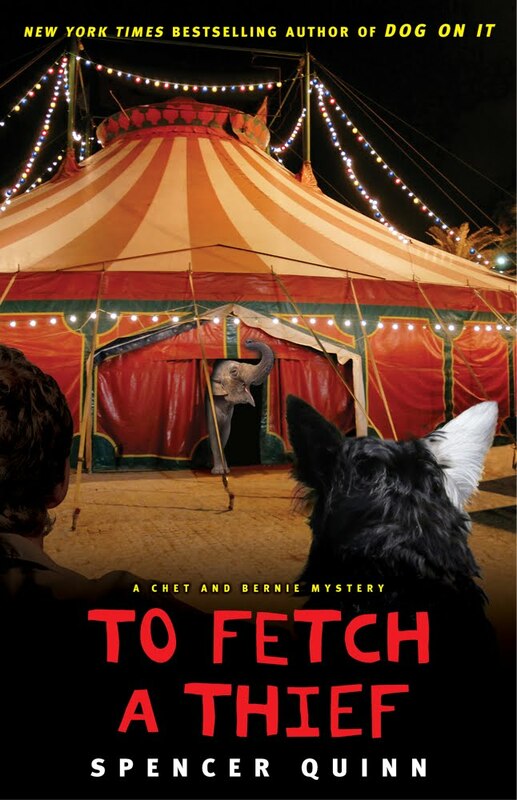 He has Asperger Syndrome, and his particular abilities enable him to solve a mystery. The best thing to see from up there is the river Thames. You can see how it loops and curves but when you are on the ground you think it is straight. The next best thing is to look at the spokes and metallic hawsers of the Eye itself. You are looking at the only cantilevered structure of its kind on earth. It is designed like a giant bicycle wheel in the sky, supported by a massive A-frame. This passage, right at the beginning of the book tells us about the Eye, but also shows us Ted's own eye for detail, and the way his mind works. He is a genius in terms of knowing about the Eye, yet also notes the 'strangers.' All through the book the author shows us these two sides of the syndrome. Ted doesn't read emotional signals very well, and has just one friend, a teacher, outside of the family. And yet he has this great facility; an 'eye' that the rest of the characters can't begin to imagine. Ted loves weather and would like to be a meterologist someday. I often don't sleep at night. My brain is filled with all the strange facts about the world. I switch on my reading lamp and listen to the shipping forecasts on the radio at low volume. I get out my weather books. I study the charts of isobars and isotherms. I examine photographs of what the weather leaves behind: dried-up lakes, wrecked shanty towns, mud-slides, people rowing boats around the roofs of their houses. And I plan how when I grow up I will help people prepare for the disasters and save their lives and their money and advise governments on how to manage the weather. Of course, being a fan of the television series, As Time Goes By, I thought of the character of Mrs. Bale who makes occasional appearances in my Letters. She pays attention to the shipping forecasts as well. And I got to thinking she may have a type of Asperger's herself. She is a bit like Ted. Particular, intelligent, but not especially 'chummy' in her personal dealings with others. The mothers sit in a nearby café while the three children stand in line to buy tickets for the Eye. A stranger comes along offering a free ticket because he is 'claustrophobic.' They all know they shouldn't accept anything from strangers but Kat, as the oldest, decides that Salim should take it and go up alone since the queue is so long she fears none of them will be able to go otherwise. Ted and Kat watch his 'pod' as he goes around but when the ride is over, Salim does not get off. He has completely disappeared. This is impossible and yet he is gone. Toward the end of a ride, a souvenir photograph is taken of each group, and when they look at the picture, Salim isn't in it. As a mother, I found this unbearably frightening. I was reminded of the one time my own child disappeared, and in that very city. We were looking at the Egyptian mummies in the British Museum when suddenly almost ten-year old Margaret was not there. 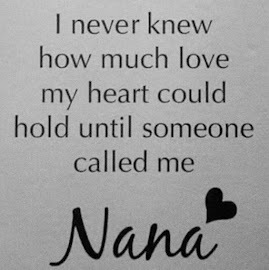 I can still feel the dryness in my throat and the pounding of my heart. The room was full of people. We couldn't see her. And then of course, there she was, but the memory has never left me. These very feelings can cloud our thoughts. Ted doesn't have them. He is able to concentrate on all the facts. I adored this book. I thought the family members were presented honestly. Their relationship with Ted is very real. 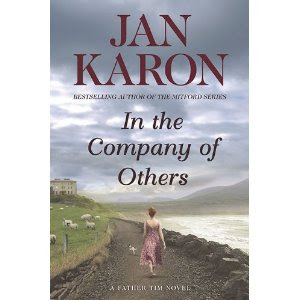 His sister gets exasperated with him and criticizes him, yet they join forces to find out what really happened. They make lists. They sneak out of the house to search for clues. We learn a lot about how Ted thinks yet because of the excellent writing, we don't focus on his situation exclusively. Often we see him as simply a character with a great gift, which is how I personally view him. Because this is such a newly recognized condition people are beginning to look back at geniuses in different fields in a new way. There is mention in this book that perhaps Andy Warhol and Albert Einstein had it. And I've read that some look at Asperger Syndrome as a difference, rather than a disability. 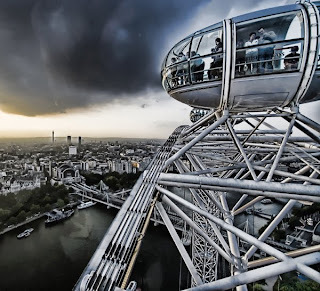 The London Eye Mystery supports this way of thinking. Before Salim disappears the boys talk about being different in their own ways. Salim has been taunted with racial epithets at his school. Another entry written for the teenage market and one which I found to be both charming and clever. The hero, as such, is an autistic boy who with his older sister (and you can imagine the relationship there) does the detecting when their companion, seen to get onto the London Eye, fails to get off it. 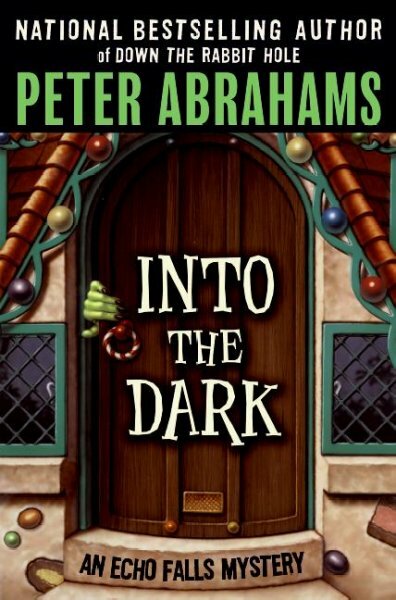 I have also read Mark Haddon's 2003 best-seller, The Curious Incident of the Dog in the Night-time, a crime novel written from the perspective of an autistic boy, and preferred this one. You may guess that I didn't read the Haddon book. I couldn't get past the murder of a dog. 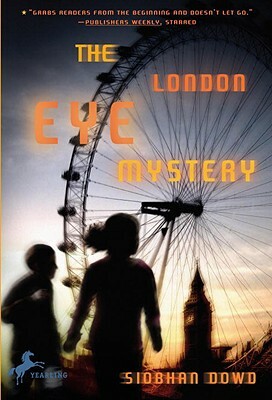 However, I can highly recommend The London Eye Mystery. Please don't be put off thinking it is a book for kids. It is well-written. It is an exciting and absorbing mystery. It is fascinating being inside Ted's mind. The characters are well-drawn, and the reader gets to enjoy a little bit of London life. This is an excellent biography of one of my favorite writers. 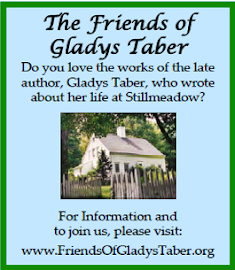 The book, and its subject will appeal to my 'kindred spirits' - those who love the Anne of Green Gables books; Gladys Taber; Gene Stratton-Porter's, The Keeper of the Bees; the gentle sorts of books which celebrate the natural world, and often a world of the past. But it is also a book for those who love learning about writers and their literary connections. As I read along, I thought, my gosh this woman knew everyone who was writing at the time, and many became her close friends. Sarah was fortunate to live at just the right time to come under the guidance of some of the most distinguished editors of the nineteenth century. These mentors, all noted writers themselves, included James Russell Lowell, William Dean Howells, James T. Fields, Thomas Bailey Aldrich, and Horace E. Scudder. Both Scudder and Howells were editors of the Atlantic Monthly which published much of her work. Fields and his wife Annie lived in Boston. Under the hospitable roof of 148 Charles Street in Boston, Charles Dickens, Matthew Arnold, and William Makepeace Thackeray read from their works and occasionally did some writing. There they met other renowned travelers as well as famous natives such as Longfellow, Emerson, Hawthorne, Whittier, Oliver Wendell Holmes, Edwin Booth, Winslow Homer, and John Singer Sargent. 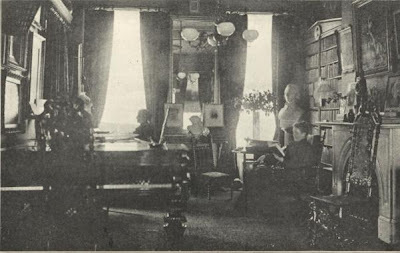 In the drawing room at 148 Charles Street - Sarah, left. Annie, right. Annie Fields was devastated; she and her husband had truly been partners in life. After the prescribed mourning period for wearing black, Annie wore widow's lavender for the rest of her life in memory of her husband. But she would survive him by thirty-four years, and she was too dynamic a personality to sink into mourning. Each encouraged the efforts of the other, and their time together was highly productive. Sarah Orne Jewett was a woman who defies expectations and stereotypes. In three instances she surprises us. We often think of writers and readers as quiet folks who like to be indoors. Sarah's love of the outdoors and of outdoor sports was as important to her as her love of books. And though she was rooted in the past, and cared deeply about old times, she was part of the modern literary society of the day. Finally, we may also assume that writers whose work is centered on a particular area mostly stay there. But not Sarah. She traveled widely during her lifetime. She visited Scandinavia, the British Isles, Europe, the Bahamas, Haiti, and Jamaica. She spent part of each year with Annie Fields in Boston. 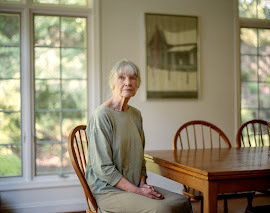 Still she had a great love of her home in South Berwick, Maine, and the area was at the center of her books. Writer Sarah Orne Jewett (1849-1909) spent much of her life in this stately Georgian residence, owned by her family since 1819. 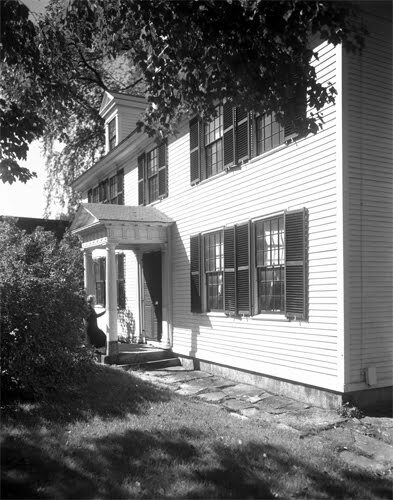 Jewett drew on the house for inspiration for her novel Deephaven and often wrote at the desk in the upper hall overlooking the active town center. Jewett and her older sister Mary inherited the house in 1887. Decorating the house for their own use, the sisters expressed both a pride in their family's past and their own independent, sophisticated tastes. The result is an eclectic blend of eighteenth-century architecture, antiques, and old wallpapers with furnishings showing the influence of the Arts and Crafts movement. As well as telling the reader about Sarah Orne Jewett's life, Elizabeth Silverthorne focuses on individual writings; telling us the stories, quoting passages, and offering reviews from publications of the time. I found this to be one of the most interesting biographies I've ever read. 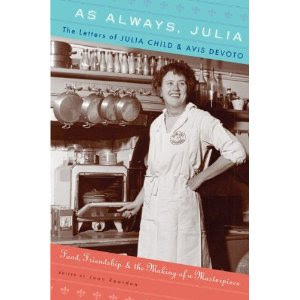 The author captured her subject, Jewett's writing, her friends, and her times in a most readable and accessible way. If you'd like to learn more about the works of Sarah Orne Jewett, there is a very complete website here. Back in November, coincidentally on the third anniversary of this blog, we got a bread machine. You may read all the reasons on that post. Well, I am here to say it is a huge success. We have never looked back and longed for the old days of me making bread. And in fact, now that we have this beautiful little kitchen appliance, Tom does all the bread baking. He enjoys using it. He can experiment and if it doesn't work, no big deal. He just puts together some ingredients and lets the machine try its magic again. And magic it is. I swear to you that the bread tastes just as good as when I made it. It tastes wonderful freshly baked and it tastes wonderful as toast. Now, I'll turn over the writing to Tom, and let him explain how he does it. The most amazing thing about the Zojirushi is how fussy it isn't. It came with both a recipe booklet and a demonstration DVD. I was amazed that you just dump all the ingredients in together and push the start button. Three hours and forty minutes later--for whole wheat bread--this beautiful loaf is ready. You can make all kinds of different breads; the booklet tells you how. Once we got the whole wheat down, we experimented by using three cups of whole wheat and a cup of Bob's Red Mill organic 6 grain hot cereal (wheat, rye, corn, oats, spelt, kamut, and flaxseed). Wow, what a nice addition to this bread. The bread machine kneads, rises, and bakes all without your attention. If you want to go to bed and have fresh, warm bread waiting for you when you wake up, set the timer. I don't often write testimonials so to speak, but with this machine I wanted to. In the photo below, you might notice a couple of unfamiliar ingredients. In addition to the flour and yeast, the recipe calls for dry milk and 'vital wheat gluten.' The whole wheat bread needs these two to help with the rising. We tried the whole wheat bread without them and sure enough it didn't rise as well and sometimes sort of sunk in the middle, as you may see here. A quick visit to the King Arthur Flour website and we were able to order these ingredients along with some excellent baker's yeast. Now every loaf is great. And here is the finished loaf you've been seeing on the blog header for several days. Another recipe from Clara's Kitchen. It could not be simpler. Three ingredients. Garlic, olive oil, spaghetti. It is so delicious and one of our favorites. "Use a small frying pan to fry up the garlic. It will heat the garlic evenly and also prevent the oil from splashing around." 2. While the pasta is cooking, heat the oil in a frying pan. When it's hot, toss in the garlic. Sauté until the garlic is nice and brown. 3. Drain the pasta and pour it into a large bowl with the olive oil and garlic. Toss a few times to get all the pasta coated, and then serve. You may of course change the amounts for a smaller group, but this gives the ratio; if a half pound pasta then 1/8 cup or 2 Tablespoons oil, and so on. I prefer to put the garlic through a press rather than mince it. I didn't cook it until brown. I also didn't toss it in a large bowl - we just put the garlic and oil on our own portions. You may know the recipe by its Italian name, Aglio Olio. We had this with the tomato salad; yes, again! We have it as often as we have tomatoes on hand. 24 new or small red potatoes - about 2 1/2 pounds (I use any kind of potatoes) Emeril notes that these potatoes are called 'creamers' in Louisiana. Chop potatoes and toss with the olive oil. Sprinkle with flour and mix well. I use a fork for the mixing. I put a piece of parchment paper (ungreased) on a cookie sheet, place the potatoes on top, and bake about 45 minutes. We had them with sautéed zephyr squash and onions; and the tomato salad. Absolutely delicious supper, and everything except the potatoes, oil, and flour came from our own garden. There's been lots of progress on Margaret and Matthew's house (see more on sidebar under Letter Topics - The Making of a Home) since the last posting. On some days, there have been builders, electricians, and plumbers all working together. That's the way to get the work done! We are so glad they went with this company, and decided to let it be the general contractor instead of hiring a separate person. These folks know what they are doing. They've built many, many log homes and know the order of work. The photos go from July 27 - August 9. Can you see a bit of a clearing between the trees? That is the lower south pasture. Up from there is the barn and across the road from the barn is our house. It's just about 1/10 mile. All the windows and doors are in! Since these last photos were taken on Monday, a lone electrician has been working down at the house.